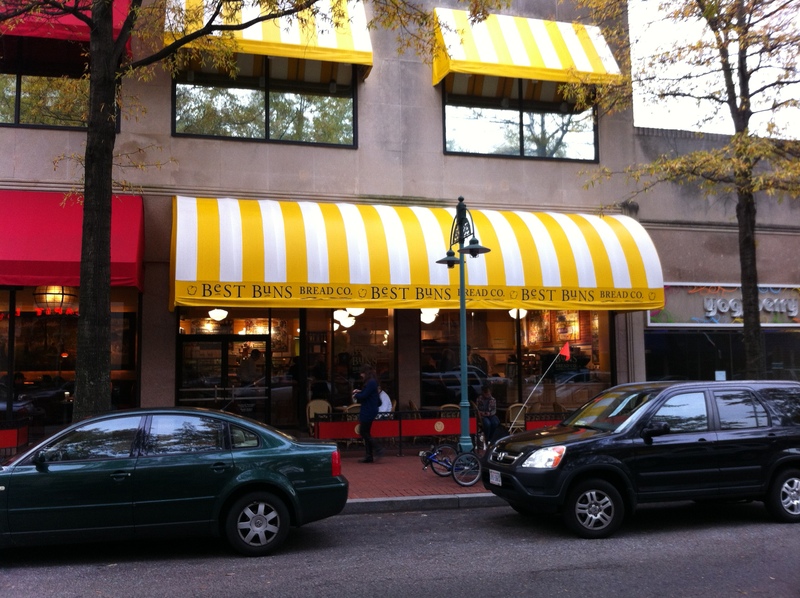 If you’re ever in the Arlington, VA area and you’re in the mood for some cheap breakfast, sandwich, or anything bread/pastry related, Best Buns Bread Co. might just be the place for you. It’s in a shopping center called The Village at Shirlington. I stop by there almost every morning before work, since it’s just a stone’s throw from the WETA building. They open pretty early most days, which is nice–with the exception of Sunday and Saturday (on Sunday they open at 7:30am and on Saturday they open at 7am), they open at 6am during weekdays, which I believe is at least two hours before everything else in that shopping center. More information about their hours can be found here. 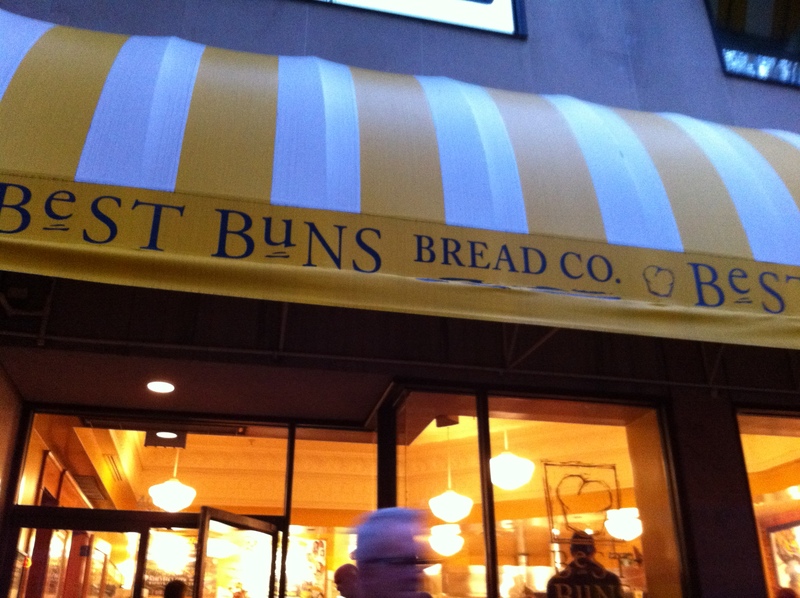 I don’t think this shop is a franchise either; I’m pretty sure it’s the only Best Buns Bread Co. out there, but I could be wrong. The breakfast here is pretty good and the price is pretty cheap–for roughly $11 (give or take a few cents) you can get a breakfast sandwich, two large muffins (seriously, they’re big), and a cup of milk. The service is also very professional, friendly, and prompt. They also are very willing to accommodate to special requests; for example, I usually ask for my eggs to be unsalted. Wi-fi? : Yes; fairly strong signal. Kids Menu? : Not that I’m aware of, but they might. Vegetarian/Vegan-friendly? : Yes to both, although for vegans it might be a little limiting since there’s a lot of items that include meat and dairy products. Recommended: Yes – In particular for people who are on-the-go that don’t have the time to make breakfast and want something cheap in the morning. At some point, I’ll make some sort of key explaining what I mean by each of the star ratings for all my different reviews, but for now I’ll just explain myself. I gave food quality only 3 stars because really the stuff they make here (for the most part) is stuff you could really throw together at home, but for those who don’t have the time (like me) in the mornings, this is a great place to get your breakfast. A warning too, for those that dislike when bread is too tough (like how it is for Panera Bread items); some of the lunch sandwiches can be a little tough to chew. The ambiance lost a point because it is a pretty small shop, so sometimes overcrowding tends to happen and there can be long wait times. Overall this restaurant has been a pretty good experience for me; I’d recommend it to anyone just visiting or passing through the area. ← Just a thought: Media influence and where to draw the line?